The RadWindow can be minimized or maximized via the buttons in its top-right corner. After being minimized or maximized the respective button is replaced by a Restore button. By clicking on this button the user can bring the RadWindow in its Normal state. 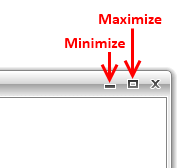 Every time when the RadWindow gets minimized or maximized, it changes its state. More about the RadWindow states can be found here. The RestoreMinimizedLocation property allows the RadWindow to store its size and position for the Normal and the Minimized states.